Research on "The Effects of Digital Tools in Second Language Acquisition"
Most countries around the world recognize the need for teaching a second language at school. However, while more than 53% of Europeans are bilingual, only 18% of Americans speak a second language. It is imperative that we offer our students the opportunity to learn a second language if we want them to succeed in the 21st century. Today, the world demands that we interact effectively with others, whether they speak our language or not. Marin County, one of the most affluent counties in California and in the nation, has 19 school districts. Many of those districts have state of the art schools, and technology is present in every single classroom. However, many of the foreign language classes are still heavily “teacher centered” and technology is hardly ever used in meaningful ways. Most schools rely mostly on the class textbook as the main source of information, and the “fill-in-the-blank” handouts are still the most common in-class and at-home activities. The lack of technology integration in our foreign language classrooms is due in part to the fact that teachers don't see its benefits and/or don’t feel comfortable using technology. 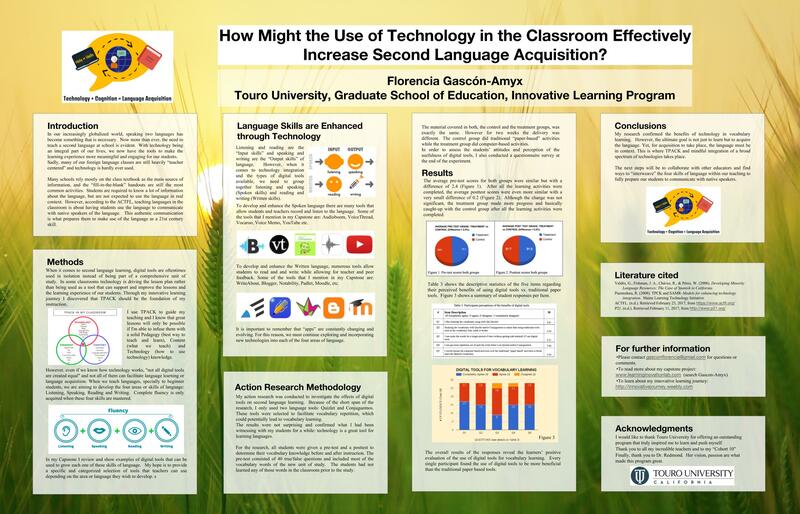 This study investigates the effects that a couple of digital tools can have on second language learning. These tools, Quizlet.com and Conjuguemos, facilitate vocabulary repetition, which in turn could potentially lead to vocabulary learning. The document below shows the academic articles I read and analyzed to support my inquiry.